I have a 2001 that I bought 2 years ago. Great car, great color, I love it! It came with a clear bra installed. Here is a picture from yesterday. While washing it this weekend, I found this damage to the clear bra on the front bumper. Close up. Notice the million or so little rock chips as well. 2) Can the clear bra be removed? Nice wheels. Sorry, I'm only here to tag along and find out what happens. My car has a clear bra on it that is ancient and looks like crap. When I searched I saw where people said if you try and peel it off it will pull up the paint. Makes me wonder about the wisdom of a clear bra if it gets damaged and can't be replaced easily. On the other hand if it can be replaced easily then it looks like it did a good job of protecting the paint. Last edited by flaps10; 02-18-2016 at 12:56 PM. One of my cars had it. There are some decent YouTube videos of various techniques. I tried everything on mine. A plastic scraper with a heat gun or adhesive solvent made progress, but I didn't have the patience. Even sanding the bumper and repainting made a mess, because I didn't get it all off. In the end, I got a new bumper (Black '99). I think it's made by 3M. Contact customer service, maybe they can suggest something. Last edited by 78F350; 02-18-2016 at 10:40 AM. You may be able to use conventional paint polish & wax to correct the damage to the bra. That's worked for me before. I pulled a clear bra off a 968 earlier this year that had been on for 10+ years. Acetone, heat gun, plastic razor blades and lots of patience were all necessary. When the bra came off, the paint underneath had been protected so well that it had not faded... unlike the rest of the car. Hard to see here, but there was a distinct "horizon" about 4 inches up the hood. The place that I use to detail the car at says they can try to get the scuff out for $125. If it does not come out than he will not charge me. To remove and install a new bra is $500. To remove the bra, polish and ceramic coat the whole car is $1200. Ceramic coat will not protect the paint from chips and scratches like a clear bra. which ceramic coating are you looking at? Last edited by JayG; 02-18-2016 at 02:20 PM. Ceramic coat will not protect the pain from chips and scratches like a clear bra. That is a good point about not protecting. I believe the ceramic they use is 22ple. I am hoping that if I take the clear bra off, that the paint will be in good shape underneath and all the chips will actually be in the bra. $125 to get that scuff out is pricey. $500 to replace the clear bra sounds reasonable. 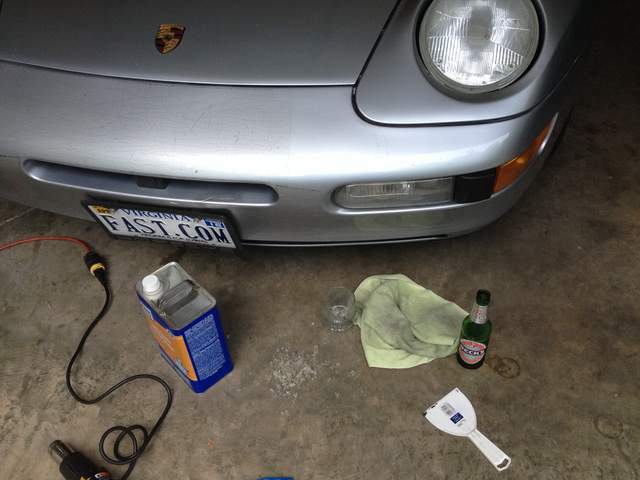 Try some of the same stuff that's used to correct faded headlights. I just used a 3M kit (bought at the local auto store for $15 and it includes the bit, various grits of sandpaper and polish) on my daughter's Mini and it worked wonders. They look like new again. The clear bra isn't too different. The only tool you need is a drill and some time. Thank you for these suggestions. The detailing guy told me he would probably use a wool pad on his polisher. Not sure what polish he would use. I will try this weekend and post results! I have a 2003 S that had a clear bra on the hood, fenders, mirrors and front bumper. The car was from FL so it had baked on. I used a plastic scraper - looks like a razor blade, but it's orange plastic and goo gone. Heat helps. You can use a heat gun or hair drier or even a small space heater. Or, just leave it in the sun for a while. The scraper will take off small bits of the plastic and will leave some adhesive behind. Then put the Goo Gone on and let it sit for a few minutes. Use the scraper again to get the residue off. You may need to apply a few times, but it will come off. Took me about 40 hours total to get everything off and the results were excellent. The car looks like new, and no paint came off. I had Opti-coat installed all over the car and Xpel installed on top of it for the front third of the car about three years ago. No problems as of yet. I had 3M transparent film on my '03 Boxster, and after about 10 years it really looked bad. After scraping with every tool I had for days, one of the body shops in town said they had good luck using a pressure washer to take the film off. I used the white nozzle on my 2500 psi pressure washer and sure enough, it took the film off easily without damaging the paint. It did leave the adhesive residue, which then came off easily with 3M Adhesive Remover. Xpel is nice stuff and it can heal itself with a little heat from heatgun or hair dryer. To OP have you tried heating up the spot with a hairdryer ?